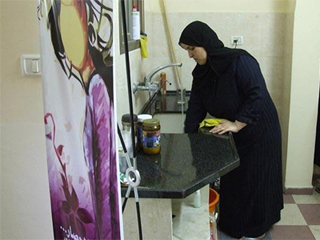 "I have been working as a cleaner at a local organisation for two months, and we use my salary to pay the rent of our house, electricity and food. My husband has a heart problem and back pains and he cannot work. 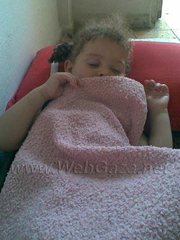 Before working at this organisation I used to clean people’s houses"
"This is my two year old daughter, Amira, sleeping. 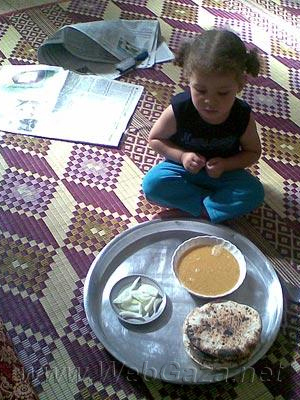 I want to make her life better, and for her to have a good education in the future. But the siege on Gaza is having a very bad impact on our lives, our economic situation, and on my daughter’s life. 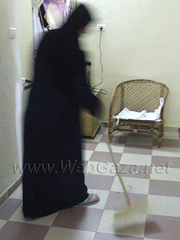 We are very poor – we cannot afford any furniture in our home, because it’s so expensive. We don’t even have a bed – just this small bed for my daughter – we sleep on the floor"
"This is me making bread, with my daughter and my sister’s son. I can’t afford to buy bread, so I am always making it at home and it takes a long time. It’s also exhausting because I work full-time. 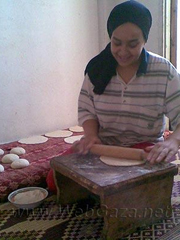 I have to find time to work, clean my house, make bread, take care of my daughter…"
"I have always made bread at home as it is cheaper that way. 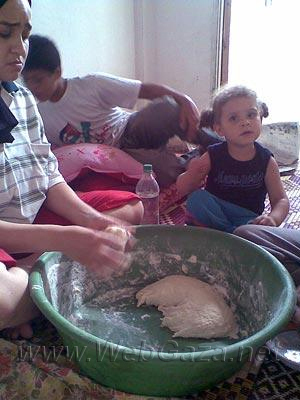 [shop bought bread costs nine shekels for fifty small pitta breads – it used to be seven shekels two years ago]. It takes me about four hours in total to make the bread, including time for it to rise. 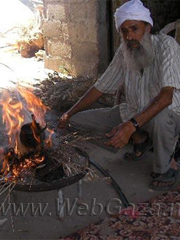 I use an electric stove to bake the bread, because there is no gas in Gaza due to the siege. And what little gas there is is very expensive. A bottle of gas used to cost 35 shekels but now its 70, so we must use electricity"
"This is our lunch – lentil soup, onions and bread. I try to make a variety of dishes but the ingredients are always the same – lentils. 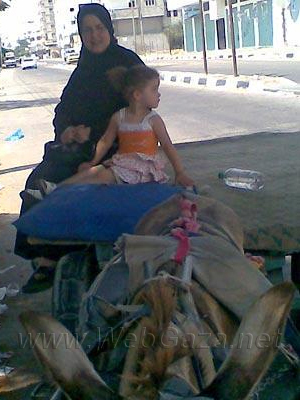 It’s all we can afford"
"This is me and Amira on a donkey cart going home from work to the refugee camp. It’s a long way so it costs us ten shekels and takes an hour and a half. We can’t afford a taxi or a car to take us home. It takes a long time to travel this way"
In April 2008 Abu Meri’s farmland was destroyed by Israeli bulldozers for the third time. 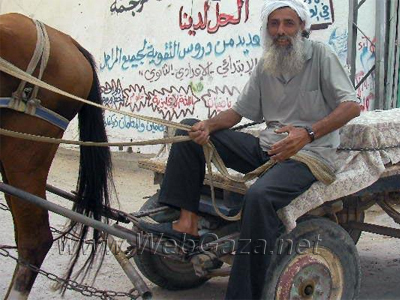 Abu is unable to afford the farming equipment he needs to re-build his farm – even though he sold his wife’s jewellery to help raise the funds. 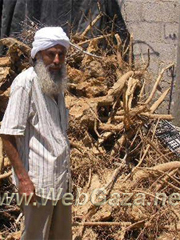 "These trees that I stand in front of used to be fruitful – now they are nothing more than firewood. 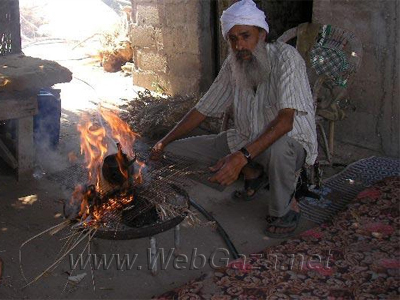 Such trees and plants are my only source of living – I used to cover all the needs of my family from them. 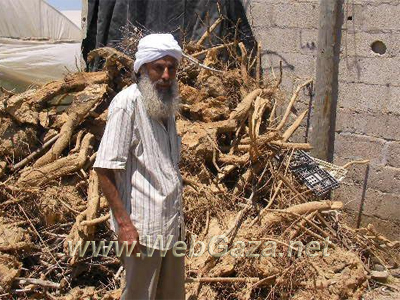 Overnight I lost my living resource"
"Since the demolition of the crops on my land and my greenhouse, my sons and I started to work as labourers on my brother’s land. 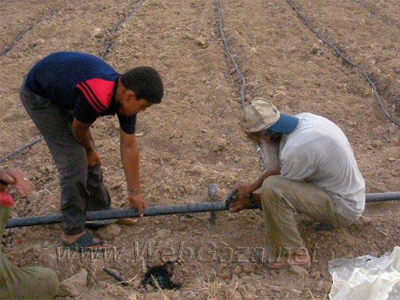 We want to work to re-build my own land but it costs too much - farms need a lot of machinery and equipment – like the hoses I use to water the fields, or the plastic sheeting I need to cover a greenhouse"
"Three of my sons graduated from university but they have been jobless so far as the opportunities to find jobs in the Gaza Strip have become so hard under the siege. So they work with me to meet the family’s needs. My other five children are still students. I keep trying hard so my children can continue their studies"
"Because of the shortage of fuel in local markets and rising prices, I no longer use my car, that used to help me in delivering goods to markets and bringing them home too. 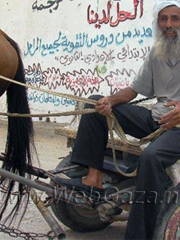 Before I used the car to get from my house in town to my land, now I have to go by horse and cart"
"I don’t feel any better regarding the recent truce between Israeli and Hamas on the one hand and Fatah and Hamas on the other. 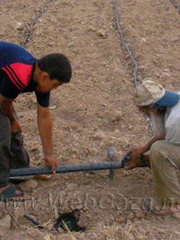 There’s still no fuel to operate the water pump to generate water to irrigate my land. 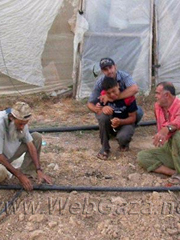 I appeal to all parties to intervene to help Palestinian farmers and solve their problems. Cultivation of our land is the only source of living for poor farmers like me. 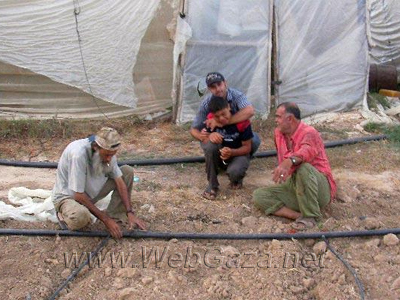 I hope there will be a truce that brings peace to me, my children and my farmland"